Runners Connect: Today we will be covering Peroneal Tendonitis, but I think first off can you just tell us a little bit about yourself and your background before we jump into the interview? Dr. Segler: Sure, of course. Thanks for having me on the Injury Prevention Summit and I’m Dr. Christopher Segler otherwise known as Doc On The Run. I am a surgically trained Podiatrist, Foot and Ankle Surgeon who also happens to be a runner and I specialize in treating runners and triathletes. I do Ironman triathlons as well. I also go to medical conferences several times a year and actually teach physicians how to keep runners running and try to find creative ways to treat runners differently than normal patients so that they don’t have to have the standard sort of immobilization and stopping running, all those sort of things that many doctors do seem to want to recommend to patients. That’s really my background. 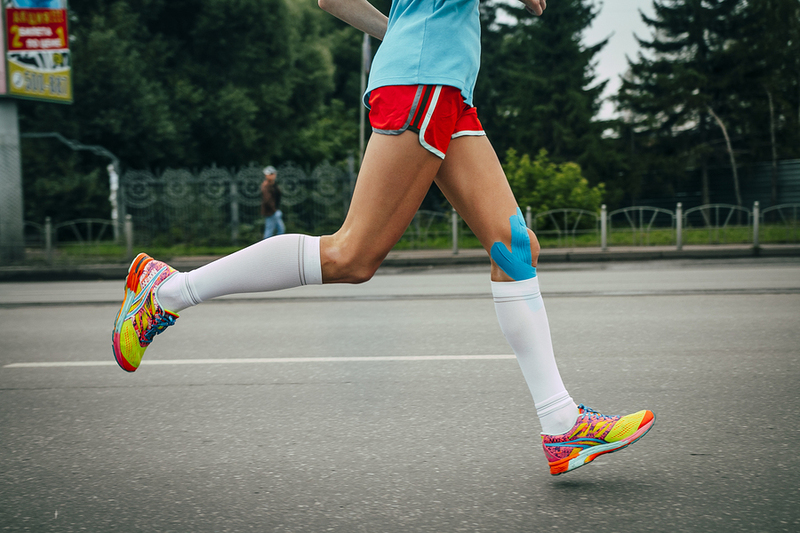 Runners Connect: First off can you just tell us what Peroneal Tendonitis is and what happens during this injury? Dr. Segler: Sure. Anything that ends in “itis” is inflammation. If you have tonsillitis, you have inflammation of the tonsils. If you have tendonitis, it’s inflammation of a specific tendon. There are basically two tendons that are the “peroneal tendons;” the peroneus brevis and peroneus longus. The fibula is the bone on the outside your ankle. The peroneus longus is way up in your leg, up high, just below the knee. The persons longs tendon comes down curves around the fibula and goes down attached at the bottom of the foot. We’ll talk about that more in a second. The peroneus brevis is the one that hurts most of the time. Its “brevis” for short because it’s shorter than the longus. It starts behind the fibula, the tendon comes down right behind the fibula bone, curves around the fibula, goes around and attaches right to the “styloid process” or little bump on the outside of the foot. Because the peroneus brevis attaches to this bump (called the styloid process) on the outside of the foot, it is the primary “evertor” of your foot. What that means is that if you start to roll your ankle on a trail or something like that, it’s the only one tendon that will pull the foot back under you. The peroneus brevis muscle is often injured. When people roll their ankle, when they sprain their ankle and they step off a curb, when they’re running on a route on a trail something like that, the peroneus brevis tendon can get flared up and inflamed. The thing is important about here is that the brevis is sitting right behind the fibula. The longus (since it’s longer) actually comes behind the peroneus brevis, curves down around the back of the fibula, goes through a little groove in the cuboid and continues down across the bottom of your foot to attach to the base of the first metatarsal at the bottom of your foot. The primary job if life of the peroneus longus is prevent the first metatarsal from lifting up. So when I’m checking a patient with peroneal tendon issues, I basically put my hand against the outside of the foot. Then I tell them to push my hand away. If they push away that motion fires the peroneus brevis tendon. If that hurts because they’re pushing and they’re firing the peroneus brevis, we can assume you have some issue with the peroneus brevis. The way that I test the peroneus longus, since it’s pulling down the base of the first metatarsal bone, it twists and locks that joint and that’s just its only job in life. Because it attaches to the base of the first metatarsal bone, and pulls at an angle, it can lock that joint. So if I put my thumb under the ball of the foot at the base of the big toe joint (under the head of the first metatarsal bone) and I ask the patient to push down against my hand. When they push down with the foot, I push up with my hand. If I push-up against the foot, and that bone lifts up or it causes pain when I push and I have them resist that motion, we know there is a problem with the peroneus longus. Most people who have peroneal tendon issues usually have pain on the outside of the ankle or the outside of the foot. The pain usually indicates where the trouble with the particular tendon might have occurred. Usually it’s somewhere around the end of the fibula where it hurts most. The pain is often described as just on the outside ankle somewhere in that area. But the important thing is that if you have a severe peroneal injury, the brevis is usually the one that causes trouble because it’s right against the fibula and if you split it or you actually rip it along its longitudinal axis, you have a big problem. The peroneus longus sits behind the peroneus brevis. If you split the peroneus brevis you only have one tendon sitting in the front, the other one is in back but if you split it then you have two pieces in front and that piece (the peroneus longs) in the back pushes its way between the two split pieces between the peroneus brevis, separates them and they never get back together. The first thing you have to understand is that’s what scares runners. Most doctors I think tend to write things on their website or in articles or magazines that freak people out. So if you read about peroneus brevis tendon tears, splits, etc., it’s almost always talking about that specific split in the back of the peroneus brevis tendon that just will not get together again unless you have surgery. In many cases these articles are written by orthopedic surgeons or podiatric foot and ankle surgeons who are trying to convince you that you should come in to see if you need surgery. Most runners don’t get that problem. You could get a split in the tendon, but it’s not an acute issue, it’s a thing that happens over a long period of time. In runners it tends to happen as a consequence of ignoring the initial injury. Those are really the main issues with peroneal tendonitis. Inflammation of the tendon happens when you do something that strains either one of those two tendons. Either you roll your ankle or you’re running on new shoes that are unstable. If you’re running in Newton’s and you’ve never run on them, you have to stabilize yourself. If you’re wobbling back and forth a whole lot as you run, the peroneus brevis tendons are firing and working hard to stabilize your foot. If you’re doing hill repeats, you are doing calf raises and you’re pushing off a whole lot repeatedly, you can actually inflame the peroneus longus tendon. But in either case, it’s basically a type of overuse injury where you’ve inflamed one or both of those tendons. Runners Connect: Okay great. So in terms of conservative treatments, ones that people would do at home, what would you suggest if they’re trying to just get ahead of the game before peroneal tendinitis progresses into something worse? Dr. Segler: That’s a great question too. I talk to a lot of different doctors about this when I go to medical conferences. I read a lot of medical journal articles as well. The thing that everybody gets so freaked out about is the splits in the peroneus brevis. 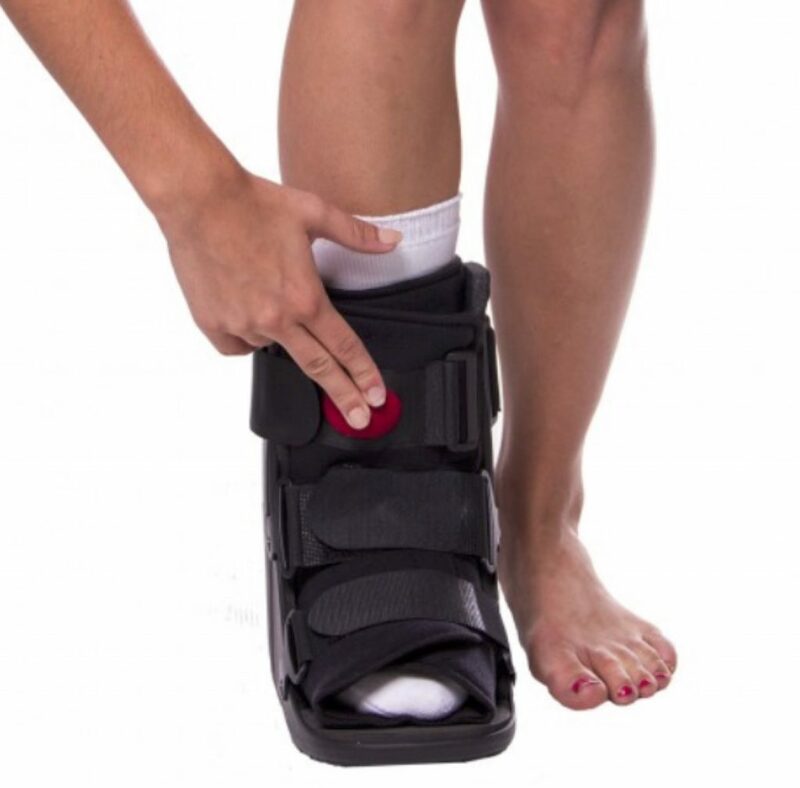 The most common treatment is a fracture walking boot for six weeks. Some doctors who say they are more aggressive may only recommend four weeks in a boot. But you do not want to do four weeks in a boot if you are a runner. So the first thing to understand is that in immobilization will definitely make peroneal tendinitis better. With most patients who have one of the mild forms of tendonitis, whether it’s peroneus longus or peroneus brevis, if they immobilize it for four to six weeks, it will get better. But that comes at such a huge price to use a runner that is worth doing it unless it’s truly necessary. I would never do that to runner unless I had an MRI that proved there was a severe problem with the tendon, because I think strict immobilization is just too risky for runners. You lose too much fitness. You get too much stiffness. You get all kinds of problems that will make you more prone to other injuries later. The whole goal is to run not just to fix this one tendinitis issue. The second thing is that with all running injuries there is a whole range of injuries. Nobody fits into four weeks or six weeks of a particular treatment consistently. Everybody heals differently. Since I only see runners, most of my patients seem to get better faster than others. That doesn’t make me a better doctor. I’m just lucky that I get to work with runners who are strong, healthy, motivated. They’re smart. They research all this stuff, figure out what they need to do. They do most of the stuff that works. They get better. I have sort of this unique set of patients that seem to heal faster than others. But it’s not me, it’s just the patients who are primed to heal. You have to do something to reduce the inflammation. With true tendonitis, it’s just inflammation of the tendon. In most runners I think it’s actually tenosynovitis (not really tendinitis). The difference is that tenosynovitis is inflammation of the sheath that goes around the tendon. Again, both of those tendons are going around a corner when they curve around the back of the fibula bone. There’s a lot of friction when you move around the back of the fibula and there’s a lot of friction when the attendant turns around a curve underneath the cuboid bone. There’s a common tendon sheath that curves back around behind the fibula. The two peroneal tendons come down the back of the leg and enter that sheath together. They go down the tunnel together. The sheath is lined with synovial fluid that has the same fluid that is inside your joints. It’s called synovial fluid. The synovial fluid inside your tendon sheath is what lubricates the tendons so they can glide around that corner. I think that in most cases of runners, the early forms are really truly tenosynovitis. So even though you push on the tendons and it hurts, it doesn’t always mean that it’s tendonitis. It may just be the sheath that is inflamed. If it’s just the sheath that’s actually good news because that can calm down really fast. If you can ice it or just do something to decrease inflammation, if you can decrease the stress to that area so that the tendons are not moving as much, tenosynovitis will calm down really quickly. If you do the right things right away, you can get better really fast. If it does get better quickly than not gives you a useful piece of information. What that means is that it’s probably tenosynovitis. Because the tendons take much longer to calm down because the blood flow is not as good in the tendon, as it is in the tendon sheath. Either way you have to try to reduce the inflammation and initially. Not just a treat the problem but to figure out whether or not you have true tendinitis versus tenosynovitis. You can either get an MRI to try to discern that or you can just try the treatments that would help the earlier forms of tenosynovitis and tendonitis. If you improve, then you have an answer. You don’t need to waste half a day and more than $1,000 on an MRI. You can often figure it out just by treating it. What I would say is that for anybody suffering from pain that they suspect is peroneal tendonitis, it really doesn’t matter that much which tendon it is. Except you want to try to remove the offending activity. But if it really hurts, you’re probably not going to be running on trails or doing hill repeats anyway. You want to try to shut off the inflammation first thing. That’s the biggest thing. What that means is that you want to ice it, do contrast bath soaks, wear compression socks, elevate (particularly while wearing compression socks) to try to force that fluid out of the inflamed area as quickly as possible. I even sleep in compression socks for a few days. When you’re flat, your blood pressure goes down, your heart rate goes down, there’s no gravity pushing fluid down there and all those things can help decrease the inflammation in the tendons themselves and the tendon sheath. That’s the first step. The other thing is that if you notice walking around the house it hurts more when you’re barefoot. Don’t go barefoot. Wear running shoes in the home. It’s not that complicated. You can have all these different steps of treatment along the way but you want to start with the simplest ones first. Runners Connect: Okay great! You did touch on some training modifications. You don’t want to run uphill and on any sort of rocky terrain. Are people good to maybe just go to the running shoe store and maybe replace their running with cross-training, while they recover? Dr. Segler: That’s a good question. I would say that if you have irritation of the peroneal tendons and you do anything that hurts them, causes pain, causes tenderness, you’re probably not going to heal fast as you should. You have to think about what caused it. So if the problem started because you were running on an unstable surface like sand, you run on sand your feet are skating out from under you. That sort of running on sand can cause the peroneal tendons to flare up initially. Obviously you don’t want to run on an unstable surface. We also run on an unstable surface in the form of shoes. You can run in really stable shoes that you know are stable for you. Trail shoes are often more stable than most cushioning running shoes or Newton’s (depending upon which ones use). Newton’s may be really unstable particularly if you haven’t run on them before. Some patients just can’t tolerate those. Just to further explain that idea, I’ll share a story of me personally. I started using Newton’s for speed work a long time ago. I will say I am a huge fan of Newton running shoes. I had done a bunch of races and I had done an Ironman race in them and then I hadn’t worn them for several weeks. I realized as I was ramping up another Ironman, it occurred to me I was like four weeks out from the race from Ironman Florida. I was thinking. “Okay these are Newton’s, I better get used to them again.” Because you do have to become accustomed to the sort of wobbly nature landing on those forefoot lugs. I wanted to use them for Ironman Florida. So I thought, I’ll run with the Newton’s this weekend. This is one of the classic mistakes runner’s make. I understand all this stuff, I write about it, I think about it, I lecture about it to physicians, you think I would know better. Everybody makes mistakes. So I thought, I’ll use my Newton’s this weekend. That’s reasonable. Well then I thought, this might be risky. But I justified my plan. This is what we do as runners. We do something stupid then we justify, we do something else stupid, then justify it. I justified it. But then we ran sixteen miles of hills. The next day, when I woke up the entire side my foot was completely black and blue. And it really hurt. This is not a good sign. Four weeks out from Ironman Florida and I had this huge bruise and swelling on the outside of my foot. I actually thought that I split the tendon. It was so sore and so bruised. Bruising is a terrible sign. If you get a bruise, you ripped something, tore something, and broke something, enough that you got bleeding under the skin that is then showing itself as a bruise. All that damage came from running on unstable forefoot lugs that I wasn’t used to. I was running too far, got fatigue, then out my tendons were working harder trying to absorb those forces as I fatigued during the run, running on hills as I got worn out. Obviously in that circumstance, the worst thing would be to run on the same shoes again. It would definitely be better to run with something stable regardless of what kind of shoes you normally run in, anything more stable would be better. Anything minimalist would be worse because your body has to stabilize yourself. But if you were to use a shoe that has a stable platform, a wide flare under the forefoot, they impart stability because that flare on the outsole works kind of like an outrigger. And that helps. You have to identify what started the problem first and not do that thing again when you are trying to run with the injury, that’s a big part of it. Runners Connect: That’s a great story that a lot of runners can relate to and I’ve done that myself quite a few times and trying out something new and in a long around that didn’t agree with me. I guess we talked about more conservative treatments. How about if those don’t work out, what would be the next step for runners? Dr. Segler: Right, let’s say is I was worried about it. Now. I can tell you for sure if I saw a hundred podiatrists ninety-eight of them at least would have said you have to use a fracture walking boot for six weeks. Again this is four weeks out from Ironman Florida. I mean I’m not stupid though. I did a stupid thing but I’m not really stupid. I tried icing it, it felt a little better after really I iced it…completely submerged my foot in ice water. Icing made a big difference. Walking around in running shoes actually felt much better. This is a good sign. It felt better after icing, I could walk in running shoes without much pain. The time. But then I also thought I only have four weeks before Ironman Florida. I don’t have time to screw around. So I wore fracture walking boot for three days. 24/7. Just wearing a fracture walking boot and completely immobilizing the peroneal tendons, just to let it really calm down. I was also wearing compression socks, by the way. I slept in the compression socks. I slept in the boot. Within just a couple of days it was basically pain-free. A think the next day I could walk on the in the boot with no pain at all. Wearing the boot for a couple of days completely calmed it down. Although it’s still bruised it was completely not painful. Then I went back to running. I was cautious about what shoes I was using. I ran around on stable surfaces. I didn’t take any chances. I was about start tapering anyway, so at least I had already made it through the largest blocks of training. I still rode my bike and I still continue to swim. Eventually I use the newtons on a few short runs just to get used to them again. I went to Ironman Florida and that was my fastest Ironman ever. So in defense of Newton running shoes I will say that even though my error in using them certainly contributed to the initial problem I was still able to race and them and have my fastest Ironman ever. The main point here is that you can recover. I was pretty freaked out about it at the time, but it did wind up being my fastest Ironman ever. Again ninety-eight percent of podiatrist told me that I couldn’t do the race and I should be watching the race wearing a fracture walking boot. You don’t necessarily have to do that. I tried more stable shoes, I tried some icing, I tried compression and then I immediately realized that I did not want to simply wait and see if I might be better after a week. Instead I decided that the best approach would be to use the boot for a couple of days just to let it fully calm down. Most people not need to do that but I had what I felt like was a really sort of compressed timeframe with high urgency to get better as quickly as possible, and that was what I did. So if you do ice, you do compression, you try some more stable shoes, then the next aggressive step is basically to try something like go see a doctor who may tell you to use a fracture walking boot, or you could get an MRI to look at it and see if you have a more severe injury before you try fracture walking. Of course the approach that I used instead was to just try the fracture walking boot for a brief period of time. The in-between treatment is to use really stiff backpacking boots. I’ve got a pair of boots that I use for approaches on rock climbs. I also use them when I fly my paraglider. They are pretty stable so they’re pretty protective. Those boots are really stiff and very stable. But they’re really backpacking boots, it’s what they are. Now I also have some plastic mountaineering boot I use for ice climbing. Those are just as stiff as a fracture walking boot. It’s obviously a lot easier to walk in hiking boots than a fracture walking boot. Most people have stiff hiking boots at home. So the next most aggressive treatment really is to try something more stable in terms of an athletic shoe. If that doesn’t make a big difference in how the foot feels, you can try backpacking boots which are really stiff, supportive and stable to try to see if that additional stability will let it calm down quickly. Dr. Segler: I just want to take a break here for a second because I realized that we’re covering a lot of material really quickly. When listening to the audio playback, I realized that I was using a number of anatomic foot models and visual demonstrations that help solidify these ideas about peroneal tendon anatomy and peroneal tendon injuries. Don’t get confused by this. If you’re having a hard time visualizing the anatomy or exactly what I was trying to explain visually, I’m going to give you two ways to better understand. The first thing is that if you want to see the actual live video recording of this lecture, all you have to do is go to DocOnTheRun.com, and I will make sure you can still get access to the video lecture. You do have to pay for that access but right now Runners Connect is offering an awesome deal. By the way, I don’t get any sort commission if you click on that link. But I do think it would be valuable for you. And the cost is really cheap. In fact, this morning I spent more money at the coffee shop then you would spend for a month of access to the all of lectures. So go to the Podcast Show Notes page for this episode on DocOnTheRun.com, click on that link, enter your email and I’ll immediately send instructions to you on how to access the Injury Prevention Summit. The second thing is I have been working on a new multi-part series on peroneal tendon injuries that is going to clearly break-down everything runners need to know about the various different forms of peroneal tendon injuries in runners. The first episode will come out next week and the others will follow shortly thereafter. So go to the show notes page on DocOnTheRun.com, click on the link at the bottom of the page, and I will make sure you get immediate free access to the upcoming episodes delivered directly to your inbox the second they’re released. Runners Connect: Obviously a lot of this comes down to footwear, but in terms of prevention, are there any exercises that may help just to prevent this injury in the future? Dr. Segler: Yes! Think about why we you get injuries? It’s really simple if you think about it. If you get injuries to the peroneal tendons, one of a couple things happen. Either you had a traumatic injury, like rolling your ankle that stretched and stressed the tendons or you have repetitive stresses which are little bitty, over and over and over motions that simulated that same motions rolling the ankle. You just had more of them to a lesser degree. You did it so many times that you got an overuse injury. That’s either because the muscle is not dynamically absorbing the force or the tendon is not pliable enough to absorb the force when the muscle fades when you lose your strength when the muscle peters out and is not able to contract efficiently. When the muscle fatigues, that muscle is not really working to absorb those forces. When the muscles aren’t dynamically absorbing the forces, over a longer period time, the tendon (which is just a stiff cable) has to absorb those extra forces. If you can have a more pliable tendon, that helps. If you have stronger peroneal muscles, that also helps. It’s not really complicated there are just a couple of really simple exercises that you can use to strengthen the peroneal muscles to protect the tendons. Obviously standing up on your toes is going to fire the peroneus longus. Calf raise exercises can certainly help strengthen the peroneus longus muscle. But for the peroneus brevis, which is one of the most commonly injured, you just have to think about how that muscle works. If we go back to the explanation of how you test the pairing is brevis you’re basically the evertor in the foot, pushing your little toe outward away from the midline of the body. That self-diagnosis test where you put your hand against the outside of the foot and you are pushing outward against resistance, again your hand, that motion is basically activating and firing the peroneus brevis selectively. So if you’re sitting at your desk or you’re sitting on a chair and cross your legs and you put your little toe joints together, and you push your little toe joints together so that you’re pressing and holding just for thirty seconds. If you’re just pressing the feet together with your legs crossed then that will actually fire the peroneus brevis tendons and strengthen them. 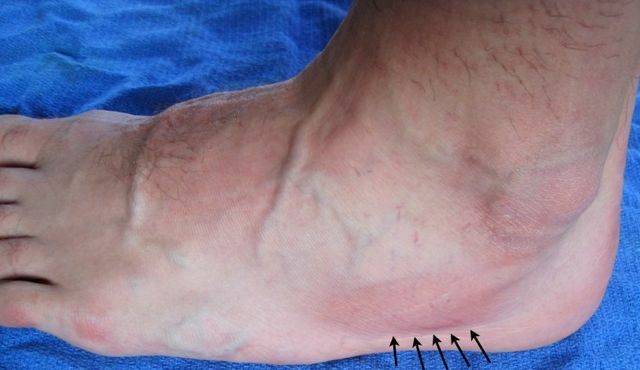 One thing that’s really interesting is that when we look at patients who have chronic ankle instability, if you measure them objectively they virtually all, have weak peroneus brevis muscles. This is one of the key exercises in the ankle sprain rehabilitation exercises I give to runners who sprain their ankles on trails. I created an entire protocol that will help runners with weak ankles after they’ve had a significant ankle sprain. I developed this whole protocol and I use it to show them exactly how to retrain their ankles, they don’t get sprains anymore. It’s very specific but there’s one exercise and it’s that one where they’re basically crossing the legs and pushing the toe joints together to try to fire the peroneal muscles and strengthen them. If runners with week peroneal muscles will just do that specific exercise ten times a day when sitting at your desk, when watching TV, you can really strengthen those muscles. I really and truly believe that something like ninety percent of the patients who get chronic ankle sprains or their ankles are weak, and they’re rolling their ankles, or at risk peroneal tendon injuries as a result, if they just did that simple isometric exercise multiple times a day, every single day, they wouldn’t have those problems anymore. Runners Connect: Yeah I totally agree! So a lot of it does come down to preemptive action like you said. Is there anything you feel like we might not touched on regarding peroneal tendon problems in runners? Dr. Segler: Yes, because I get this question all the time and it’s about popping and clicking with the peroneal tendons. Runners can get what we call “subluxing peroneal tendons.” That’s where the tendons, which are supposed to be sitting behind the back of the fibula in a depression or trough in the bone move out of that groove and cause a popping or clicking sensation. 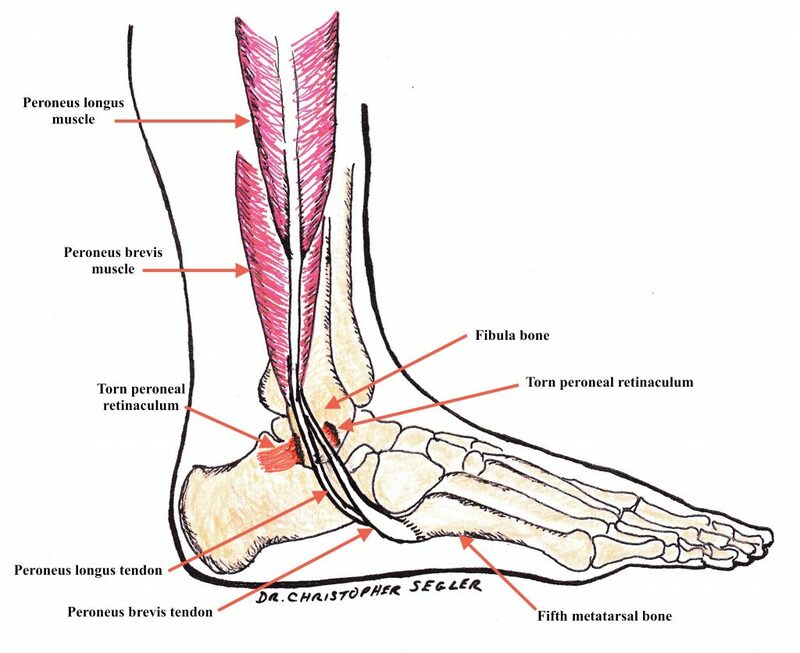 There is a band of t issue called the “retinaculum” that holds the peroneal tendons in place. There are three shapes or anatomic variations of the fibula bone. In one case it has that little groove or trough where the peroneal tendon can sit in the trough so when they fire they don’t flip forward. Some people, the back of the fibula bone is kind of flat. In some people, the back of the fibula is actually curved outward which is not great. 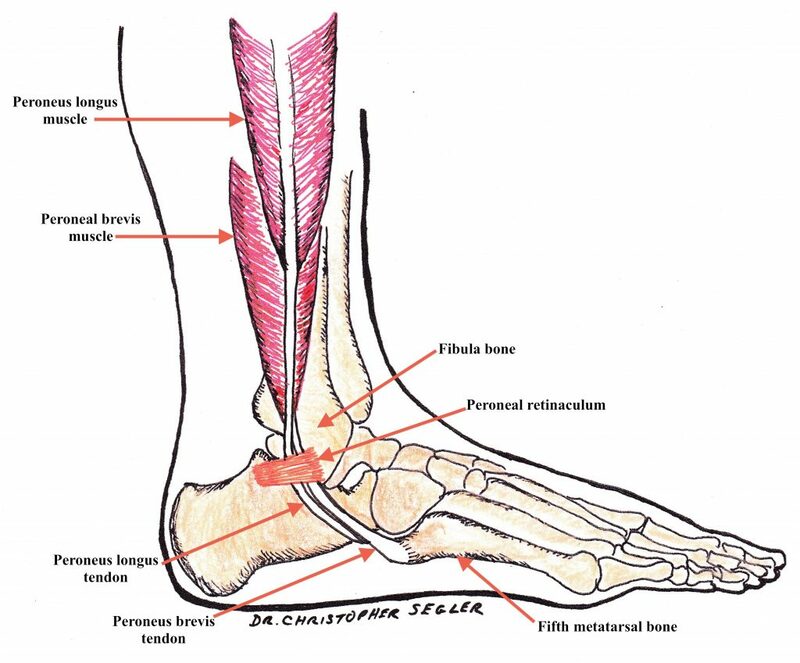 In the cases where the back of the fibula bone curved outwards, which is the opposite of having a trial for the tendons can sitting there securely, it’s really easy for the tendons to pop toward the front of the fibula. When they pop on the little edge of the fibula bone they can make a popping and clicking sound. The tendons can just flip back and forth and make a popping and clicking sound. But it’s not always a problem. What I mean by that is that it may make noise, you may feel it but if it doesn’t cause pain may not be the problem that has to be corrected. My ankles have done that my whole life. Many years ago when I was in college, I was working in a climbing store. This guy Brent used to always tell me that I could never work for the FBI because I can ever sneak up on anybody. Because you could hear my ankle popping and clicking all the time walking around the store. It’s been doing that forever. Although it does popping click I did not get any pain when I run it doesn’t bother me when I run. It doesn’t swell. It doesn’t hurt it. It’s not a problem. If it’s not a problem, you don’t have to worry about it. That’s the main point. You have to remember that whatever the problem is you have to decide whether it’s a real problem or it’s just an annoyance. Alternatively however, if you have popping and clicking in the peroneal tendons and you get recurring peroneal tendon issues, you’re not doing something silly, you’re not running like forty miles on sand or running a really unstable trails all the time or running on shoes are too unstable for you, but you have popping and clicking and you continue to get issues with the peroneal tendons, you could either have a torn peroneal tendon retinaculum (the band of tissue that holds the peroneal tendons behind the fibula). A torn peroneal retinaculum allowing the peroneal tendons to slide forward and out of the retromalleolar groove. As the tendons slide back and forth around the edge of the fibula bone they make a popping clicking sound. Or, you could have one of those oddly shaped fibula bones that just puts you more at risk of the peroneal subluxing. You just have to be aware that but that the shape of the groove on the back of the fibula is not something you can fix easily. We can fix it with surgery, you don’t really want to do that if you’re a runner. If you can avoid it otherwise but you want to address that if that is your issue. Runners Connect: Okay interesting! When it comes to this injury, what percentage is prompted by that issue? Dr. Segler: It’s pretty rare. I think there are lots people who have popping and clicking and they assume it’s a problem. Mine is not a problem. I run on the Dipsea trail all the time. I have run on trails for a long time. I run on all different kinds of shoes. I have run on lots of different kinds of shoes, on a lot of different surfaces. Technically speaking since I do a pop in clicking, I have some issue with my peroneal tendons but it’s never a problem. The only problem I ever got with my parenting attendance was because I did something really stupid running sixteen miles in unstable shoes when I wasn’t used to them. It’s not the popping and clicking. It’s not the movement of the tendons in there. I think that true subluxing peroneal tendons are very rare. However, if you go to an orthopedic surgeon and you tell him you have popping and clicking, and if you had any history or problems on the outside of your ankle, they’re likely to tell you need surgery to fix that. There’s two ways to do this surgery to change the shape of the back of the fibula. One way is that the “old school” way. This way is terrible for runners. We actually surgically open the ankle. We pull the peroneal tendons out of the way. On the back of the ankle we actually take an osteotome (which is a fancy word for chisel) and we make basically a slice in the bone on the back of the fibula in approximately the width of the peroneal tendons. We basically just take the chisel and tap into the bone and it cuts into the bone. Next we take a “bone tamp” which is a metal instrument about the size and shape of a pencil. We laid the bone Tampa right there on the back of the fibula between the two chisel slices in the bone. We hit the bone tamp with a hammer and caves the back of the fibula in. That makes a groove. The problem is it that the bone also bleeds so then you get scar tissue between the tendons in the back of the fibula bone which causes another problem. The better way to do it is to actually take the tendons out of the way and shove a drill into the end of the fibula (where the tendons aren’t touching the bone). Then basically by holding the drill bit underneath the bone we basically are spinning the drill bit as we move it up and down behind the area where the tendons sit on the back of the fibula. This method keeps the covering of the bone intact. If you keep the covering of the bone impact you don’t getting scarring between the tendons in the bone. As we spin the drill bit under the surface of the bone we can see the drill bit through the bone because the bone is opaque as the drillbit gets close to the surface of the bone. The surgeon just has to make sure not to Carver way too much bone and inadvertently go through the surface of the bone. So basically we kind of grind it away and then we put a bone temp in there. We push it in so it makes a concavity but it doesn’t disrupt the surface. And you don’t get as much scarring that could cause problems. You’re going to get scar tissue. You really don’t want scar tissue between the two tendons. As a runner, you want to avoid surgery for sure! Runners Connect: Okay, that’s great to know. Dr. Segler: Actually there is one other thing we should probably talk about. There are two other conditions that often get misdiagnosed this peroneal tendon issues. If you search online, and you look at the anatomy of where be peroneal tendons hurt, there are a number of structures underneath there. So it’s not always the tendons causing problems. I even created this symptom finder on my website. Basically, if you have any pain in the peroneal tendon area, the symptom finder will help you understand all the things that can go wrong in this area. It doesn’t seem like much but this little bitty corner of the bone right there can crack when you roll your ankle. It’s right underneath the peroneal tendons. If you push on the peroneal tendons there, you’re also pushing on the lateral process. When I was in medical school we were taught that those lateral process fractures are extremely rare injuries. We were taught that research studies have shown that the incidence of lateral process fractures was only 0.9% of ankle sprain injuries. However, I saw a whole bunch of lateral process fractures and my first year of residency so I didn’t think I was true. 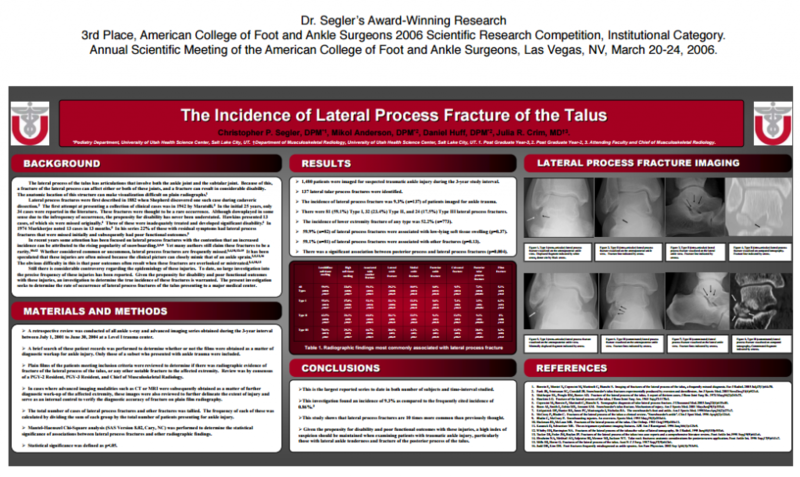 Because I am curious and like to disprove conventional wisdom sometimes, I organizing conducted the largest study ever regarding lateral process fractures of the talus. So we did this huge study at the University of Utah where we looked at all of the people that came in to the University Hospital and clinics over at three year period. There’s a lot of people that get injured in Utah because there’s ice on the ground, people snowboard, people run, it’s really an active area. 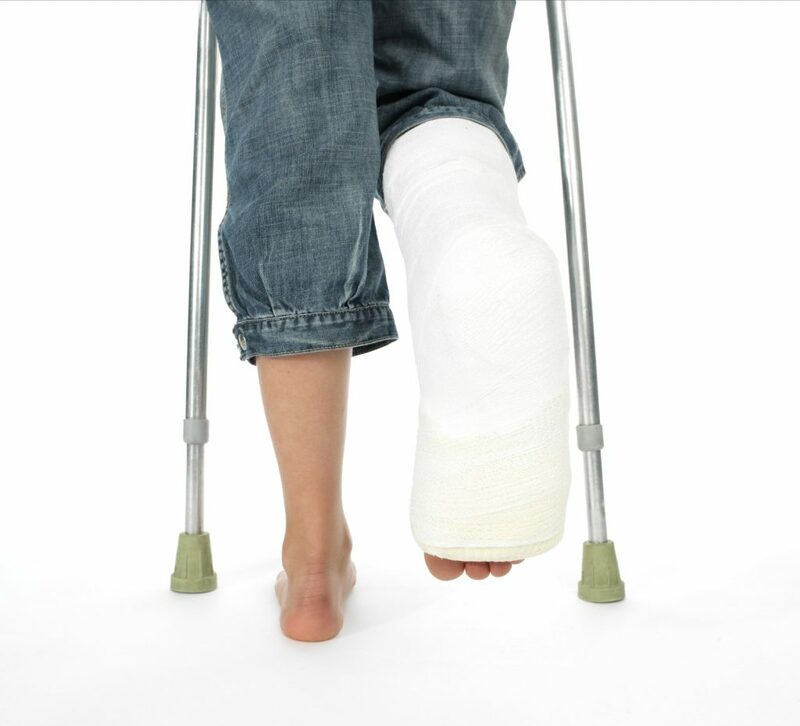 We looked at a huge number of patients and what we found was that actually almost ten percent of all people who sustained ankle sprain and go to get treatment had a lateral process fracture. It’s more than ten times more common than previously thought! I actually won an award from the American College of Foot and Ankle Surgeons for that research because it was a huge study and it showed something completely different from what everybody has always been taught. As an example, one time I saw a guy who was a runner when I was in residency. I was actually walking to the treatment room to see him in an orthopedic clinic. His x-rays were up on the x-ray view box in the treatment room. I took one look at them and said, “Hey you have a lateral process fracture!” And he started crying. He was really upset about it because he felt like an idiot for two years. He actually started to wonder whether or not he was making this up. Lateral process fractures are easy to misdiagnose. 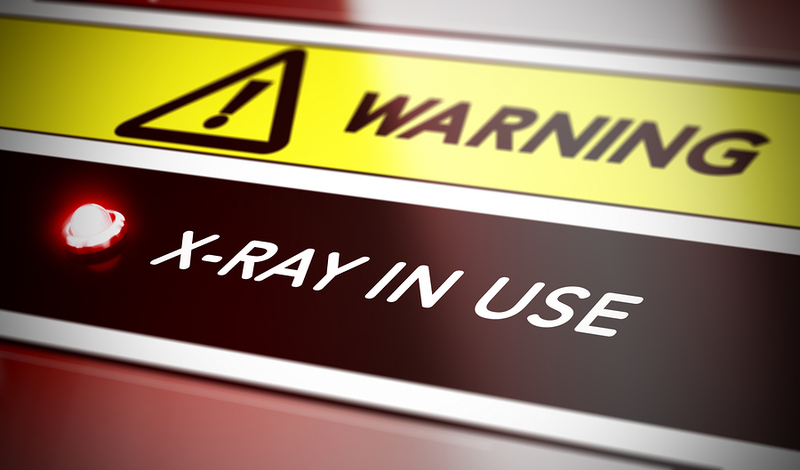 If you have the wrong X-rays, if the x-ray images rotated just a little bit, your doctor can completely miss it. Interestingly one of the findings that actually really correlates with a lateral process fracture it is related to the pattern of swelling. On the initial X-rays, if the soft tissue swelling is perfectly symmetrical, it’s not likely to be a lateral process fracture. But if the soft tissue swelling is centered below the end of the fibula, it’s really way more likely to actually be a lateral process fracture. When we did this huge study, we work closely with the Chief of Musculoskeletal Radiology at the University of Utah. She wrote a textbook on foot and ankle radiology. She has always talked to her fellows and residents in radiology about how to not miss these lateral process fractures. Yet, after we finished our research study, she actually went back, took all of our data, all of our cases and then reviewed them to see how many of her own residents actually missed them. So even though they’re supposed to be the experts they were still missing them. The main point here is that if you don’t get better, if you try these simple things and you’re not really improving, we just have to be aware that you could actually have a broken bone. You may have misdiagnosed, if you’re not going to get better. So if you try to get better and you’re not improving then you have to seek treatment. You really need to get an MRI or a CT scan to figure out when you might have one these latter process fractures so you can get the right treatment. Runners Connect: That’s amazing, gosh! I can’t believe that story, it’s amazing that the doctor would say that to a patient. A lot of times doctors think we know what will work. When the patient doesn’t respond the way that we think the healing patient should respond, based on what specific injury we have decided they have, we often by default will always think the patient must not be doing what I told them to do. Otherwise the patient would be better. It never occurs to some doctors they could possibly be wrong. But you as the patient, as a runner in particular, you have to be aware that sometimes doctors actually think that way. Runners Connect: Yeah and I think with the doctors that deal with runners quite a bit like yourself, they do know that there a lot of variables that go into a situation. So like you would be better with a running injury specialist. That’s really interesting. Dr. Segler: No matter where you, you have to find a doctor who really does work with runners. Because if the doctor understands runners, then you are more likely to get better faster. Doctors you understand runners are also more likely to help you understand how to keep training and working toward your specific goal, as opposed to just making the pain go away. The pain going away is important, but running is more important. Runners Connect: Absolutely! Thanks so much Dr. Segler! Dr. Segler: Thanks for having me as a guest lecturer on the Running Injury Summit! At this point you should have a good idea about peroneal tendon injuries and what you should do if you’re a runner and you want to get back to running. But if you’re at all confused make sure you go to the go to the show notes page on DocOnTheRun.com, click on the link at the bottom of the page so you can get to access to the video lecture AND immediate free access to the other episodes that explain all the specifics of peroneal tendon injuries in excruciating detail as soon as they come out. Don’t let peroneal tendon injuries keep you from running. There’s always a solution. You just have to find the right solution for you!